The impressive features of the Ergobaby 180 Reversible Stroller will get you thinking „where have I been all these years” as a mother. Let’s start with the reversible handlebar, the four lockable wheels that can swivel, and the huge canopy that comes with a vented seat top. These are not all – there are many more features that make this stroller outstanding. Also, it is not all positive with the Ergobaby 180 Reversible Stroller, there are a couple of downsides too, and we will definitely discuss each of them in this informative guide. Although Ergobaby is a popular brand when it comes to baby carriers, this is the first stroller it will be producing. The Ergbobaby 180 is a single stroller, so only one little passenger can be on board at a time. Fortunately, you can convert it into a travel system – Ergobaby was thoughtful to make it compatible with infant car seats, although you will need to get the adapter on your own. 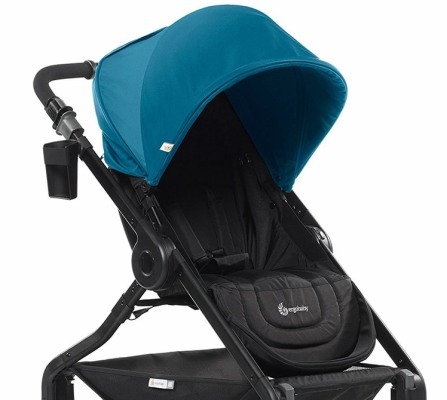 The canopy was mentioned in the first part of this guide as one of the most impressive features of this stroller. This canopy, with three panels that offer ample shade on full extension, is just what you need for summer strolls. Whether or not the seat is reclined, your baby is well covered, especially with the added sunshade, which keeps sun’s heat and rays away from your baby at all times. So, here is a complete summer stroller, with a canopy so extended that it requires no cloth diaper or blanket. The last thing to mention about the canopy is the little peek-a-boo window. The magnetic closure of this window ensures complete silence at all times while allowing you to steal multiple glances at your little passenger while on the go. 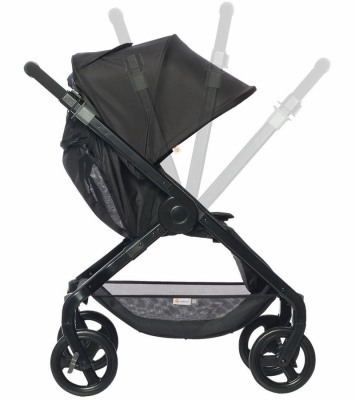 The handlebar is arguably the most important feature of this stroller, due to its reversibility. You can easily switch from the parent-facing to the front-facing modes just by flipping the handlebar. There is a lever on each side of the handlebar, pull these levels and reverse the handlebar – it takes a few seconds! Absolute convenience for most parents, who love to ride with their child facing them or older kids that like observing the surroundings while on the move. Fortunately, there is no need to remove the seat just to reverse it. The seamless reversibility is bliss. This handlebar also has an adjustable height setting. You can choose any height from 39 to 42 inches from the ground, making the stroller suitable for parents with extreme heights. The telescopic nature of the handlebar (rather than the conventional rotation) means you have extra space behind the stroller, where you can keep your long legs rather than kicking the back of the stroller (that is if you are tall). 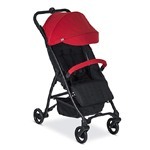 You have a deep recline in the Ergobaby 180 Reversible Stroller seat. You can have an almost fully flat positioning, which makes the seat great for infants of three-months-old and above. It is even better when you combine the seat with the Ergobaby Comfort Cushion, which offers additional support for the neck and body of the baby. According to Ergobaby, newborns can use the seat; however, combining it with the infant car seat would be a safer option if you are looking to use it for your newborn. The backrest can be manipulated with a single hand, all thanks to the special buckle placed at the back of the seat. Squeeing this buckle releases the backrest. Raising the backrest, on the other hand, requires your two hands. The first hand will hold the strap while the other slides up the buckle. While this is no doubt old-fashioned, it requires a little effort to get done. NOTE: Here is a quick one – always use your two hands to recline the seat when your little passenger is sleeping. Let your first hand tighten or loosen the strap, while your second hand is holding the backrest and simultaneously bringing it down slowly. It is the only way to recline without disturbing the sleeping baby. Still on the impressive features of the Ergobaby 180 stroller, let’s take a look at the vented seat top. You will be amazed at how large the mesh appears, considering that the window is small. Hence, you are well covered for summer strolls, with the mesh panels allowing effective ventilation and circulation in the interior. Your baby will never sweat or disturbed by the serious heat that comes with the weather. You can cover the mesh panel for additional protection of your baby. There is a calf rest and footrest on the main seat, although none is adjustable. You will agree that there could be a better arrangement – an adjustable footrest that would have made napping quite comfortable with the recline. Considering that the feet of the little baby will most likely not reach the edge of the seat, napping will not be a problem. However, if your child is older and prefers napping with his legs up, such a child would not be comfortable in the seat. The padding is great – luxurious, comfortable, and of course, deep; nothing offers more comfort during strolling. Ergobaby also equipped the seat with a 5-point harness, which comes with a release button strategically placed at the middle. This harness is quite simple to use for parents, but your baby will find it difficult to control. You can set the strap as you want. To overcome the challenges with the strap, just add a clip or strap adjuster to the wide shoulder pads. This will increase the grip of the pads on the little infant. Note that this is not applicable in every harness. There is an option of a snack tray, which can also house the sippy cup of the baby. However, this does not come out of the box with the stroller. 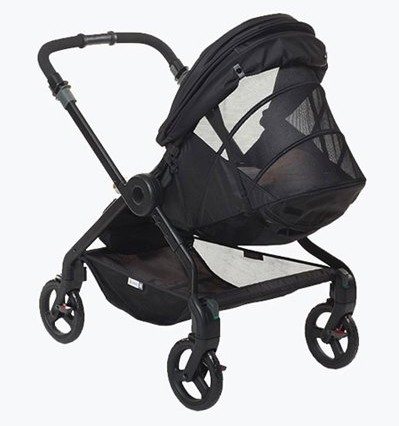 This stroller will work with several infant car seats from NUNA, Cybex Britax, Chicco, and Graco among other manufacturers. If you are expecting a super big wheel in the Ergobaby 180 Reversible Stroller, you may be slightly disappointed. While the wheels are not too big (after all, the stroller is not meant for rough terrains), they are perfect for everyday use. The EVA foam tires do not come with a suspension system. Hence, it is important that you stick to smooth and even terrains such as bricks, pavement, and other flat terrains. 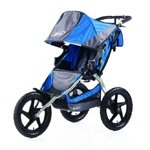 It is not recommended to try this stroller on rough terrains – your baby will most likely experience shocks. The coolest feature in these wheels is the ability to swivel and lock. You also have the four-wheel steering option that allows the entire four wheel to turn 360-degrees non-stop. This facilitates easy maneuvering and control, even in very tight corners. Also, you can push the stroller sideways. Note that this feature works best on smooth surfaces, especially in the airport, mall, or grocery store walkway. It is advisable to keep the rear wheels locked when moving on the cracked sidewalk, gravel, or grassy paths. Each of the four wheels can lock separately by using your feet to tap the wheel lock, before rolling them into position. Whenever you are in the two-wheel steering mode, and you decide to change the handlebar position, always ensure that you unlock the front wheels while locking the two that are nearer to you. After locking the wheels, engage the lock by spinning them slightly. If the terrain is a bit rough, it is advisable that you keep all the four locked for more durability. Furthermore, the brake for each wheel is independent. Although the pedals aren’t too big, you can easily access them if you ever need to press or lift them. For best results, avoid open toe shoes when you are trying to lift the pedal. It makes lifting easier! The importance of a big and spacious basket cannot be overemphasized, considering how much you have to take with you on the stroll, including your jacket, spare towel, a blanket, a diaper bag. You have so much space in the Ergobaby 180 storage basket – so much that you can keep one or two shopping bags conveniently. The basket is not giant though, but if you are just going to keep a large backpack and a diaper bag in it, you can rest assured of ample space to keep other items. It is important to note that the basket has short sidewalls, hence losing items is very likely. You can reach the bin from behind the seat. However, in a fully reclined position, getting through to the bin can be a bit challenging and may require you to bend down. Oh, both sides are open, and you can pick your items from wherever you wish to. Keep in mind that the footrest cannot be flipped, which means that you cannot access it from the front. 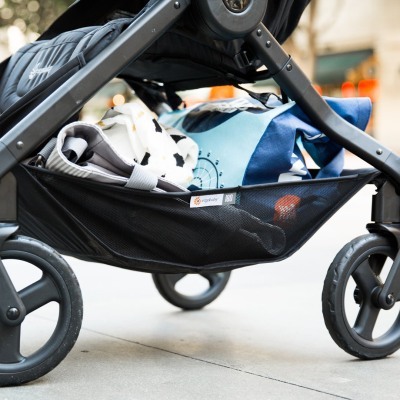 Once the stroller is set to the parent-facing model, accessing the basket directly becomes impossible, and you will have to go through the back to access the items. You will find a single storage pocket at the back of the seat, close to where the reclining straps are kept. This is the ideal space to put your cellphone, bottled water, snacks, or wallet. You will find this pocket quite useful, especially when the stroller is in the front-facing model. The parent-facing model, on the other hand, leaves no pockets close to you. However, you have the cup holder handy, and you can keep your beverages in them. The strap that comes with the holder means you can keep cups and bottles of various sizes in it without them falling off. You will find it quite simply to fold this stroller. There is a handle in the middle seat, find it and pull it. This will close the stroller into a half, and lock it straight. It is straightforward and can be done singlehandedly in a few seconds. For more compactness, simply apply more pressure on the canopy fabric. In the folded position, the stroller will stand, although you will have to tuck in the handlebar. The folding of this stroller is outwards – a downside – considering that it exposes the fabric to dirt. Also, when standing after being folded, it usually stands on the handlebar. The handlebar is covered by foam, and the pressure may rip it. Keep this in mind when storing the folded stroller in the trunk of your car or home store. You can carry the folded stroller with the same handle you used to close it when folding. When folded, the dimensions of this stroller are 30 x 23.5 x 14 inches. This is an impressive compact size for a standard convertible stroller and rests assured that it will fit into most car trunks if not all. Now, if you want to open the stroller after folding it, you need to put in some skills. If you master the skills, however, it is something you can execute with just one hand and the baby in the other hand. Start by pressing the unlock button on the frame to unlock the folded stroller. The next step is to unfold the handlebar before opening the stroller completely. Doing this with just one hand means you may need the support of your knee. Another impressive feature of this stroller is the presence of a green indicator, right on the side of the seat. This indicator tells you when the seat is correctly and safely positioned for strolling. 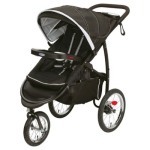 Most users are amazed at the lightweight of the Ergobaby 180 Reversible Stroller – at just 20 lbs. This is lighter to similar convertibles in the market, including the Chicco Bravo Trio, Britax B-Free, UPPAbaby CRUZ or VISTA. The width of this stroller is 23.5 inches, so you can rest assured of easy passage through all elevators and doorways. 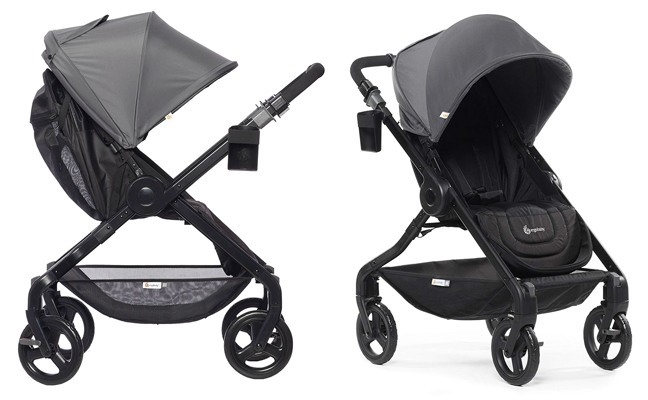 Having taken a closer look at the reviews of past and present users of the Ergobaby 180 Reversible Stroller, here are the most talked about positive features. Easy folding, with some people labeling the easiest they have seen. Extended canopy alongside a window that makes no noise. The mesh back comes handy for the hot weather. The flipping reversible handlebar is lauded, as well as its ability to adjust to the height of the parent. 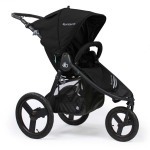 The lightness of the stroller, which never affected its sturdiness is another great feature for users. The spacious storage basket is also usually mentioned. Adjustable wheels and steering, with various unlocking and locking options and methods are cool, and come handy in making maneuverability quite easy, especially with one hand on even smooth terrains. There are complaints as well, including: It takes time to gets accustomed to the 360-swivel wheels and the methods of locking them. Considering that the stroller is not built for the rough terrains, strolling one can get the wheels stuck. However, if you are only visiting the malls, zoos, or playground, there are no problems whatsoever. The footrest cannot be adjusted – a slight downside for older children that would like to sleep on the move. A couple of users report the frame as bulky, despite fitting through most doorways. There is no snack tray, out of the box – and most parents are disappointed with that. Although this can be purchased separately, parents feel it should have been included considering the price. There is no parent console as well. 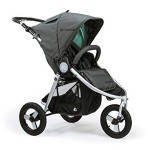 There are five color variants of the Ergobaby 180 Reversible Stroller. In each case, the seat remains black, but the canopy color can be red, black, graphite, blue, misty, or teal. Always check to see if your favorite color variant is available before purchase. 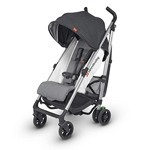 Ergobaby is currently selling a premium fashion of this stroller, called the Marigold. This variant is a product of a collaboration between Baby Tula and Ergobaby, and it is known for its beautiful, yet spacious, canopy. This limited edition variant is only available for a while, so you may want to get it as soon as possible before it goes out of stock. 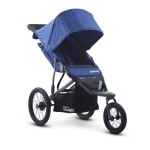 This stroller is compatible with a couple of accessories, which are discussed below. 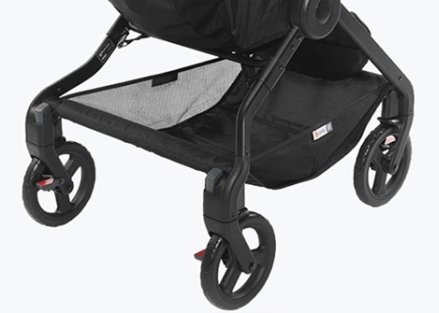 Note that only the cup holder comes out of the box when you buy this reversible stroller. Comfort Cushion – offering more support for the neck and spine of the baby and great for one-year-olds. Weather Shield – keeps your baby safe from the rain, wind, and snow, and while at it, it ensures adequate ventilation. Now you can use the stroller at any time of the year. Snack Tray – comes handy in keeping your baby’s snacks and sippy cup. NUNA and Cybex Cars Seat Adapters – make the Ergobaby 180 Reversible Stroller compatible with the NUNA Pipa and NUNA Pipa Lite. The Cybex adapters make it possible to use the Cybex Aton, Aton 2, and Aton Q with the frame of the stroller. The stroller is foldable without removing the adapters. 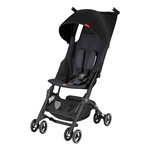 Britax Car Seat Adapters – comes handy in making this stroller compatible with the Britax B-Safe 35 and B-Safe 35 Elite car seats. Folding is also possible without detaching the adapters. Graco and Chicco Car Seat Adapters – with these multipurpose adapters, the Ergobaby 180 can work with almost all Graco and Chicco infant car seats, such as the Sugride Connect 40, 35LX, 35, 30LX and 30, as well as the KeyFit 30 and others. Do not forget that this stroller does not have a bassinet option. However, the recline position is almost totally flat, plus your infant can enjoy extra body support pillow by the seat padding. Ergobaby suggests that you can put newborns in the seat without any hassles. Despite this, it is recommended that you only use the seat for three-month-olds at least, for safety purposes. Good luck!